The silver-topped gold peridot necklace is from around 1870. It has 8 cut-cornered emerald-cut peridots and 15 pear-shaped peridots. The jewelry is decorated with old mine, old European, rose-cut diamonds. 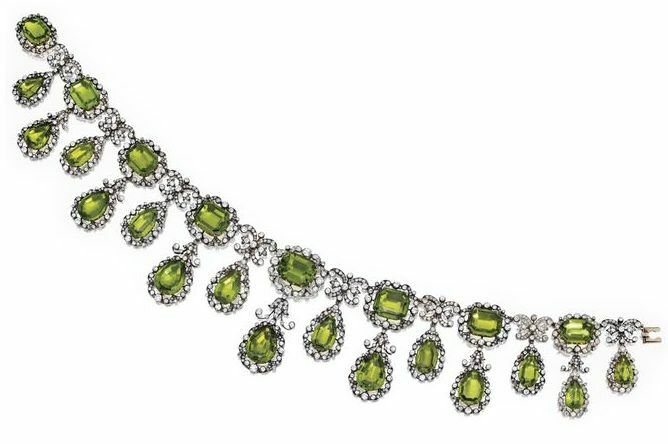 The length of this beautiful peridot necklace is 17 inches. It is possible to change its length for variety of wear due to detachable segments and pendants.